Place the prepared potatoes in a large saucepan with enough salted water to cover the potatoes. Bring to a boil; reduce heat and simmer for about 12 to 15 minutes, or until potatoes are fork tender. Drain well in a colander; return to pan or bowl and mash thoroughly. Set aside to cool. In a large bowl, combine the beaten eggs, cooled mashed potatoes, flour, salt, pepper and nutmeg. Stir until mixture holds together and a heavy dough forms. If the dough is wet and not holding together, add more flour, 1 tablespoon at a time, until dough is sticky and dumplings can be formed. Divide the potato dough into 8 equal portions and shape into dumplings. Bring a large saucepan of salted water to a boil. Carefully, drop the dumplings into the boiling water and cook for about 10 minutes, or until the dumplings float to the surface. Remove with a slotted spoon. Meanwhile, place chopped bacon and onion in a skillet, set over medium heat. Cook for several minutes until the bacon renders fat. 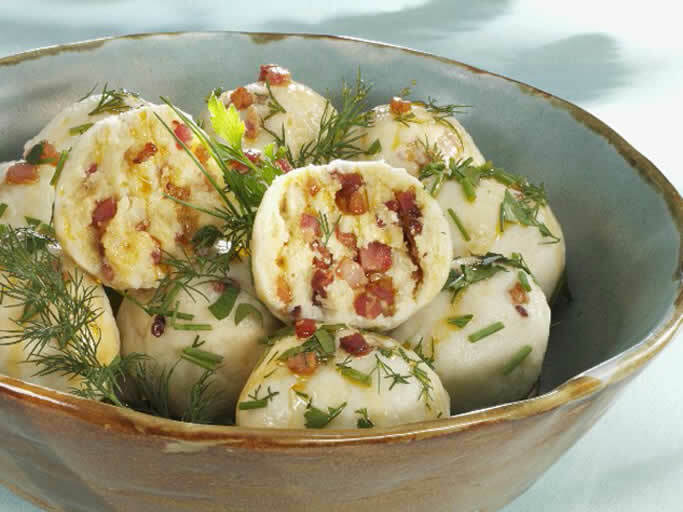 Place the hot dumplings into the skillet; cook until the bacon is crisp and slightly browned. Transfer dumplings to a serving bowl. Drizzle with melted butter and garnish with fresh chives and dill. Serve.